That is Israel is .002% the size of the USA. Click here for comparison maps. A large amount of news, analysis and political rhetoric is disseminated daily about the current American-initiated Israeli-Palestinian peace negotiations. However, comparatively little attention — and, hence, insufficient understanding — is given to a critical aspect of the decades-old conflict: population growth. Differential rates of population growth are redefining the relative demographic standing of Arab-Israelis, Jewish-Israelis and Palestinians in the region, pointing to a challenging demographic future for the Jewish-Israeli majority and affecting key negotiating concerns, positions and strategies, including establishing borders, the status of settlements and the return of Palestinian refugees. The tract of land at the center of the conflict — the former British Mandate of Palestine – is relatively small. The combined surface area of Israel and the State of Palestine (the Gaza Strip plus the West Bank) is about the size of Haiti and can be fit into Texas about 25 times. The relative proportions of this combined territory are 79 percent Israel and 21 percent Palestine territory (20 percent West Bank and 1 percent Gaza Strip). The total number of people residing in this tract is also not large. Fewer than 13 million — numerically equivalent to 4 percent of the US population — live there. As is widely acknowledged, the central defining characteristic of this population is its religious affiliation. A brief look at the past provides insight into the demographic status and growth of the major religious groups in this troubled land. 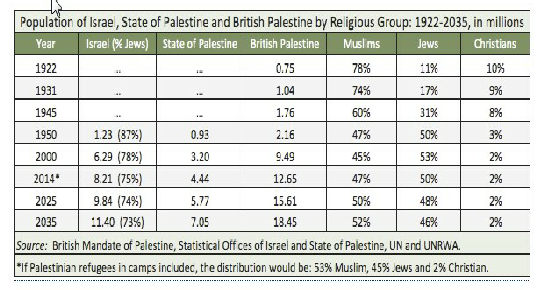 With the establishment of the British Mandate of Palestine after World War I, the first British census of Palestine in 1922 enumerated a total population of about 750,000, of which 78 percent were Muslim, 11 percent Jewish and 10 percent Christian (Table 1). Nearly 25 years later, before the United Nations’ partition of the Mandate for Palestine, in 1947, the population had grown to nearly 1.8 million, with 60 percent Muslim, 31 percent Jewish and 8 percent Christian. There are nearly five and a half billion people on this earth, of whom about fifteen million—less than one third of one percent—are classified as Jews. Statistically, they should hardly be heard of, like the Ainu tucked away in a comer of: Asia, bystanders of history. But the Jews are heard of totally out of proportion to their small numbers. The Jewish contribution to the world’s list of great names in religion, science, literature, music, finance, and philosophy is staggering. During their 4,000 year existence empires such as the Greek, Roman and Ottoman have appeared and vanished. To each the Jews made substantial contributions and by each they suffered problems ranging from additional taxation, expulsion and pogroms. Concepts such as prayer, redemption, universal education and charity were understood and used hundreds of years before the rest of the world was ready to accept them. Between 2000 and 1200 BCE Abraham introduced monotheism to the world. Following the Age of Patriarchs. Joseph invited the Jews to settle in Egypt where a new pharaoh enslaved them. They left under the leadership of Moses (the Exodus) and received the Torah (Law) at Sinai. Joshua conquered Canaan which led to two centuries of rule by the Judges. This was succeeded by the period of Kings - Saul, David, and Solomon. After Solomon’s death about 931 BCE his kingdom was broken up into two states. Israel. In the north with ten tribes and Judea in the south with two tribes. Judea lost its independence to the Romans in the 1st century BCE, by becoming first a tributary kingdom and then a province of the Roman Empire. The first Jewish–Roman War also called the First Jewish Revolt or the Great Jewish Revolt, lasted from 66 CE insurrection to the fall of Masada in 73 CE. The commemoration of the victorious Roman army is still seen by the Titus Arch in Rome. The Bar Kochba revolt (132–135 CE) — is called the Second Jewish-Roman War (when the Kitos War is not counted in the sequence as it started outside Judea), or the Third Jewish-Roman War when the Kitos War is counted. Following the defeat of Bar Kochba Hadrian saw Judaism as the cause of continuous rebellions. He prohibited the Torah law and the Hebrew calendar and executed Judaic scholars. The sacred scroll was ceremonially burned on the Temple Mount. Hadrian hoped that renaming would result in their being forgotten so overcoming fears that Jewish success would follow their future rebellions. Just as happened with Carthage, writing Judaea and Jerusalem off the map would make them disappear. Judea was renamed Syria Palæstina and made a Roman province by merging with Roman Syria. The name Palæstina was based on the Latinised form of the Philistines who had been an ancient enemy.. Jerusalem was to be inhabited by his legionnaires and renamed ‘Aelia Capitolina’ Latin in full: Colonia Ælia Capitolina. The Jews were forbidden from entering Jerusalem, except on the day of Tisha B'Av. (Today, while it commemorates the destruction of the Temple, it also commemorates other Jewish tragedies, many of which occurred on this day, such as the expulsion of the Jews from Spain in 1492 CE and from England in 1290 CE). "Jerusalem ... was so thoroughly razed to the ground by those that demolished it to its foundations, that nothing was left that could ever persuade visitors that it had once been a place of habitation’. Most remaining Jews from the Bar Kochba rebellion went to other countries where they sometimes lived in peace, sometimes suffered pogroms, lived in ghettos, had work restrictions, extra taxation and expulsion and acted as an obvious target to blame for local problems. While Hadrian's death in 138 CE brought a significant relief to the surviving Jewish communities Judaism had had a critical change. They no longer had a ‘home country’. The Jews were dispersed throughout world (diaspora) with a portable religion that was centered around local synagogues. During this time they created a body of law and made major contributions to finance, trading, literature, science and social institutions. In 1948 the Jews returned home so restoring Israel. Though being dispersed and with no country of their own they had created a body of law and made major contributions to finance, trading, literature, science and social institutions. (Names sometimes breed confusion. the name Judah (written in Assyrian cuneiform as Yaudaya or KUR.ia-ú-da-a-a). Judea was sometimes used as the name for the entire region, including parts beyond the river Jordan. In 200 CE Sextus Julius Africanus, cited by Eusebius (Church History 1.7.14), described "Nazara" (Nazareth) as a village in Judea). The demographic features of Israel are monitored by the Israel Central Bureau of Statistics. The State of Israel has a population of approximately 8,585,000 inhabitants as of September 2016. 74.8% percent of them are Jews (about 6,419,000 individuals), 20.8% are Arab (about 1,786,000 individuals), while the remaining 4.4% (about 380,000 individuals) are defined as "others" (including family members of Jewish immigrants who are not registered at the Ministry of Interior as Jews, non-Arab Christians, non-Arab Muslims and residents who do not have an ethnic or religious classification). Generally, population trends in Israel reflect distinct patterns of three sub-groups: Non-Haredi Jews (around 63.3% of the population), Haredi (strictly Orthodox or ultra-OrthodoxJews) (11.7%), and Arabs (20.7%). Over the past decade, the Muslim annual population growth has fallen significantly from around 3% to less than 2.2% by 2013, while the overall Jewish growth rate rose from around 1.4% to 1.7%, primarily due to the expanding Haredi sector. After the failure of United States mediated peace talks, the Gaza-Israel war and the recent tensions in Jerusalem, the prospects for a near-term settlement to the Israeli-Palestinian conflict have reached an all-time low. Given those conditions, it is useful and perhaps productive to revisit and reconsider the fundamental solutions for resolving the conflict. Numbers, too, help to understand the situations in the region. The total for the Jewish population in Europe in 1800 of over 2,000,000 hides the extraordinary geographical movements that had taken place since the fourteenth century. A virtually non-existent Jewish community in eastern Europe had now become by far the largest in the world, whereas the Jews of western Europe had been reduced from 30% of world Jewry to less than 4%. While the Jewish population of eastern Europe increased from about 5,000 to 1.5 million during these five centuries, the size of the general population increased from some 20 million to just over 50 million. The enormous disparity can be explained by migrations from both the west and the south-east and by both a higher rate of birth and a lower rate of child mortality. The Wikipedia statistics show the massive movement to the Americas, the increase in Asia due to the immigration into Palestine and then Israel after it was created in 1948. In Africa the fall was largely due to the movement from South Africa. How have the Jews been able to survive as a people for over two millennia - much of that time dispersed, without a land and often beset by enemies determined to oppress, if not destroy, them? Until recent times, it was acknowledged that, first and foremost, rabbis and scholars who knew and could interpret Jewish law were an integral component of the community’s leadership. Jews were taught that the guardians of a city were not the soldiers or magistrates, but those who taught the Bible and Mishna and instructed in Halakha. This implied a certain set of priorities. Until the emancipation, the Jewish community was recognized as a separate legal entity by the state’s ruler, and thereby had the authority to compel its members to obey. Yet the mechanisms of enforcement, the harshest being the Herem, the Ban of Excommunication, were very rarely used. The main means of coercion were public opinion and communal pressure. As long as the King acknowledged the community’s right to self-government, its members complied with its rulings as if there were a local government. The rabbis, being both the instructors and the judges of the community, exerted a very strong influence. Yet in most communities the public and the lay leadership - usually the well-off members - were able to restrain the more extremist rabbis and prevent them from unpopular Halakhic decisions. Again, rabbinical leaders could emerge from any social background, for religious education was available to all boys and the rigid class distinctions of other societies were less in evidence. The Jewish religious practices and public prayers maintained an intensive communal life. This was not just a question of Jewish tradition, but was also partly a result of the precariousness of Jewish existence as a religious minority and an ethnic group. Judaism did hold the promise of the hereafter for every pious Jew. But it also always encouraged the struggle to improve life in this world, coupled with a determination not to accept the ‘status quo’ if existing conditions inhibited social progress. In this connection, it should be realized that Jewish communities became highly organized, not only for education but also for social welfare. The less fortunate - the widow, the orphan, and the sick - all became the responsibility of relevant local communities. Communal bodies looked after the various needs their members and provided help for the needy, burial and, of course, education. Social cohesion and mutual support were encouraged, and it was considered a sin for a Jew however poor, to refuse to help a fellow Jew. Education was also significant. Since the time of Ezra there has been an insistence in Jewish life on widespread literacy and constant practical religious study. Jews were not only taught to read the Hebrew Bible, and later the Talmud and its commentaries. but were also encouraged to use these books as a guide to daily living, Their content provided the justification for Jewish survival; a belief that it was the responsibility of the Jewish people to maintain the ethical monotheism of the prophets. Judaism was never just a religion; it was a total way of life. On the other hand, it was this legal, ethical and social system which preserved the Jews united and conscious of their allegiance to their religious fellows, to their ancestors in the past and to their descendants in the future. Throughout much of Jewish history, the value placed by Jews on learning was in contrast with the attitude of outside society. This was particularly true in modern times, when education was often restricted to the clergy and the vast majority of the population were illiterate peasants tied to a local lord who could barely read or write. The Jewish stress on learning put it in very high esteem. It was not unusual, for example, for a Jewish man to spend his evening hours studying in the yeshiva. (academy) or the synagogue after, or even before, returning home from a hard working day. Again, when arranging a marriage a family would seek a scholar for their daughter or the daughter of a scholar for their son. Learning was often appreciated more than economic success. Another element was the family. In the family, the woman played a very important role. Although to modern observers her role may seem subservient, with no life of her own, her duty was to raise children, to maintain a proper Jewish home, and to enable her husband to continue his religious learning; yet she was always accorded respect both by law and custom. The factors mentioned so far have mostly been positive. Many would claim, however, that it was the negative factor of anti-Semitism which, more than any other was responsible for the survival of the Jewish people. In other words, continuing anti-Jewish pressure has kept the Jews together. Jean-Paul Sartre claimed that the Jews maintained their affiliation to their religious communities and Jewish consciousness only because they were always reminded of it by an anti-Semitic world. There have been, however, periods and places in which the Jews not been subjected to oppression or attack. Yet during such periods the Jews not assimilate. but created new centres for a creative and rich Jewish life. Vital though each of the above factors may have been for the process of survival, there still had to be an underlying determination to resist either blandishments or threats to convert on the one hand, and oppression and anti-Semitism on the other. The basic conviction shared by the majority of Jews is the need for the continued separate and distinct existence of Judaism and the Jewish people - at no matter what cost to the individual. Historians, rabbis and thinkers have provided a number of answers to the question: the feeling of being a ‘chosen people", and the messianic hope, the religion and the purity of Jewish monotheism, the uniqueness of the Jewish spirit, ­an inborn and unique talent for survival, an ability for adaptation and for rebuilding national and religious centres beyond the original homeland, ihe ever strong attachment to that original homeland, and other similar factors. Ir has not been our intention here to authenticate any of these explanatory theses, but rather to revue the varied historical conditions of Jewish survival. The survival itself is a fact. The central role of religion until emancipation is also indisputable. But in the post emancipation period, many Jewish movements and communities were non-religious altogether. Is there a valid explanation of Jewish survival or does it remain the Jewish enigma? However, comparatively little attention — and, hence, insufficient understanding — is given to a critical aspect of the decades-old conflict: population growth. Differential rates of population growth are redefining the relative demographic standing of Arab-Israelis, Jewish-Israelis and Palestinians in the region, pointing to a challenging demographic future for the Jewish-Israeli majority and affecting key negotiating concerns, positions and strategies, including establishing borders, the status of settlements and the return of Palestinian refugees. The tract of land at the center of the conflict — the former British Mandate of Palestine — is relatively small. The combined surface area of Israel and the State of Palestine (the Gaza Strip plus the West Bank) is about the size of Haiti and can be fit into Texas about 25 times. The relative proportions of this combined territory are 79 percent Israel and 21 percent Palestine territory (20 percent West Bank and 1 percent Gaza Strip). Population projections for the next 20 years indicate continued demographic growth for both Israel and the State of Palestine. The Palestinian population is expected to grow more rapidly than the Israeli population because of higher fertility rates. Whereas the Israeli population is expected to increase by about 40 percent by 2035, the Palestinian population is projected to increase by nearly 60 percent (Table 1). Population projections also show that while the Jewish proportion in Israel will decline slightly over the next two decades, it will continue to be the dominant majority of the Israeli population, 73 percent in 2035. This is not the case, however, when one considers the entire future population residing in the former British Palestine. Demographic projections indicate that less than half of the future population residing there would be Jewish, 48 percent in 2025 and 46 percent by 2035. But if only the West Bank population were to be incorporated into Israel, the Jewish proportion would be a declining majority, 57 percent in 2014 to 53 percent by 2035 a declining majority, 57 percent in 2014 to 53 percent by 2035. The Atlantic Is It Time for the Jews to Leave Europe? The New Yorker Why Jewish History Is So Hard to Write New books by Simon Schama and Martin Goodman present very different approaches to their subject. at roughly 8,972,000, a 2 percent bump from last year. 1.878 million are Arabs (20.9%) and 426,000 are classified as “Others” (4.8%). A total of 185,000 babies were born in Israel in 2018, the CBS says. Jewish state in the past year, nearly 84% of whom are not Jewish.